SANTA MONICA, CALIF. (Nov. 14, 2012) — The Recording Academy® Producers & Engineers Wing® reprised its popular GRAMMY SoundTables® event at the 133rd Audio Engineering Society Convention at the Moscone Convention Center in San Francisco, on Saturday, Oct. 27, 2012. 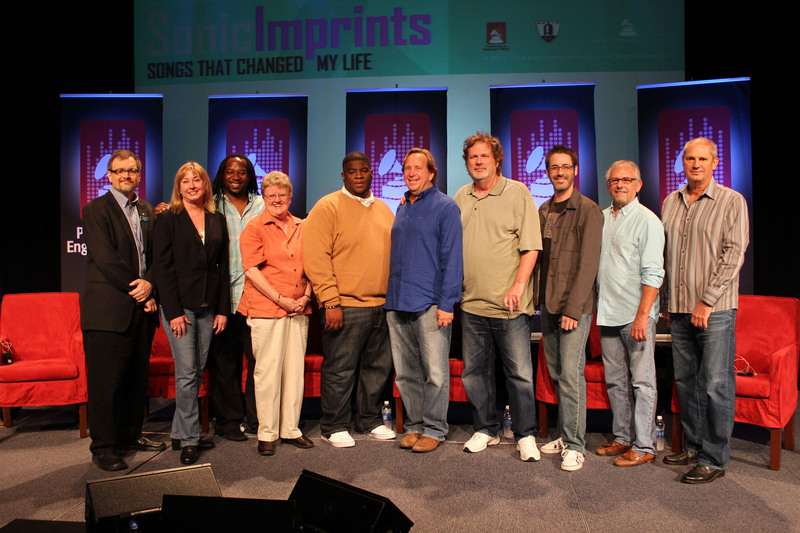 The event, titled "Sonic Imprints: Songs That Changed My Life – Part 3," was the third installment of the well-received series that explores songs that inspired and shaped the careers of recording industry and pro audio influencers. Two-time GRAMMY® winner Ed Cherney, producer, engineer and mixer for artists such as the Rolling Stones and Bonnie Raitt, moderated an all-star panel that included Ryan Hewitt (Blink 182, the Avett Brothers), three-time GRAMMY winner Leslie Ann Jones (Kronos Quartet, Bobby McFerrin), multiple GRAMMY nominee Salaam Remi (the Fugees, Amy Winehouse), GRAMMY winner Dave Pensado (Black Eyed Peas, Pink), and seven-time GRAMMY winner Elliot Scheiner (Eagles, Steely Dan). Panelists were asked to choose two songs that significantly influenced their career choices, and to break down the DNA of their favorite tracks and explain what moved them, what grabbed them, and why these songs left a lifelong impression. Songs chosen by panelists and played for the audience of more than 500 included the Allman Brothers' "In Memory Of Elizabeth Reed" (Pensado), the Police's "Spirits In The Material World" (Hewitt), Stevie Wonder's "Think Of Me As Your Soldier" (Remi), Barbra Streisand's recording of "Any Place I Hang My Hat Is Home" (Jones), and Steely Dan's "Haitian Divorce." Scheiner told the audience how his "one-stop divorce package trip" to the Caribbean inspired Steely Dan's Walter Becker and Donald Fagan to chronicle it in song. The event was once again a huge success and gave the audience a rare insight into how music affects and influences even those at the core of the process. Maureen Droney, Senior Executive Director of the P&E Wing, stated, "The GRAMMY SoundTables event continues to be a thought-provoking and entertaining highlight of the AES Convention. Once again, we brought together a diverse group of leading industry professionals who shared their thoughts on what inspired them to devote their lives to the art of recording music."